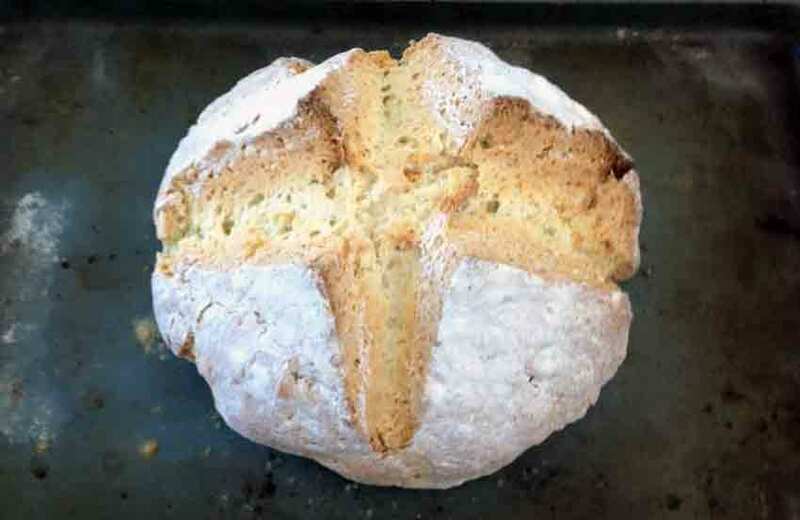 Irish soda bread is known as a quick bread because the recipe calls for buttermilk and baking soda instead of yeast. The acid present in buttermilk acts on the baking soda immediately, so there is no wait time for the dough to rise like there is with a yeast bread. If you use regular milk or a milk alternative, you will get a dense bread. By acidulating the milk with 1 tbsp of vinegar or lemon juice, you not only get a great subtle flavour, but the acid interacts with the baking soda and puffs up the bread beautifully in the oven. If you don’t have buttermilk, mix 1 1/2 cups of milk with 1 tbsp of lemon juice or white vinegar. In a large bowl, whisk together the dry ingredients. In a smaller bowl, combine the buttermilk and oil. Add the liquid ingredients to the dry all at once, mixing with a fork until a dough forms. Lightly dust a work surface and lightly flour your hands. Knead about 10 times and press into a circle. Place on a lightly oiled baking sheet. Use a knife to make an X in the centre of the dough, wiggling the knife back and forth a bit so as to open up the dough. The X should be about 1/2 inch deep. Sprinkle with 1 tbsp of flour. Bake for 45 minutes. (Bread is baked when it reaches an internal temperature of 190 F).